"This thesis is refreshing in that it states that the Irish are not a homogenous fiction called 'celtic' but an energetic mixture of many peoples and cultures inhabiting what for thousands of years has essentially been an island trading post. The maritime perspective brings them a lot closer to mediterranean peoples - including Arabs and Berbers - than to the jaded fictions of 'Celts' or 'Aryans'." 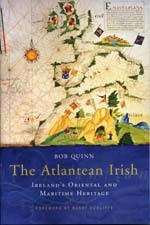 THE Atlantean Irish book and films show that the island of Ireland was never a remote outpost on the fringes of Europe. From the hunters and fishermen of the megalithic age, then the Carthaginians of the 1st Milennium to the crooked investors, carpetbaggers and drug smugglers of the modern age, from Eastern monks fleeing persecution to 19th century prosletysers, from the Mediterranean to the Baltic, the island has always been regarded as a lucrative trading post and a desirable residence. This Atlantean adventure, in the Bob Quinn version, is not the fanciful residue of a submerged continent or a racist fiction called 'Celts'. It is a revelation of Irish identity using much the same sources and scholarship that have been available for the past 1000 years to armchair scholars and writers. But here, for the first time, their conclusions are exposed to the light of commonsense i.e. historic reality, field research and wide travel. ATLANTEAN can be viewed as an anti-racist polemic but because the first edition was published over 25 years ago - long before Ireland became an uneasily cosmopolitan society - it is much more than that. The basic principle is that the sea does not divide peoples - it unites all countries and human beings. For a couple of centuries the Vikings ruled the Atlantic waves from the mediterranean to Norway. Dublin was their slave emporium. 800 years later the pirate corsairs from North Africa maintained the connections - as far as Iceland.They even kidnapped the entire population of Baltimore, Co. Cork and brought them back to Algiers. The island of Ireland was and is a traffic island. The project began innocently enough when, nearly thirty years ago, an Irish film maker, Bob Quinn, set out to show that the singing style of his neighbours in Gaelic-speaking Conamara in the West of Ireland was much more than a debased and incomprehensible version of ballad-singing - which was the attitude of anglophones. Over the following thirty years he showed how similar it was to North African and Afro-Asian singing and daringly went on to discover historic, religious, artistic, archaeological and linguistic similarities with Hamito-Semitic cultures. The response to the original films and book was intriguing. Pioneers of the Irish maritime heritage - people such as the late John de Courcy Ireland and the intrepid Tim Severin - were delighted. Traditional Irish musicians loved the idea, felt it endorsed their natural instinct to explore rhythms and harmonies hitherto considered un-Irish. Conservative academics, particularly 'celtic' scholars, maintained a public silence while privately attacking the thesis. However, prominent and open-minded scholars were pleased that a hitherto-repressed perspective on Ireland had seen the light of day. Cunliffe's 2001 book 'Facing the Ocean' precisely confirmed Quinn's 1984 imaginative speculations. His 'Celtic from the West' (edited Cunliffe and Koch, Oxbow 2010) further supports the Atlantean perspective. And now, significantly, the latest mitochondrial DNA researches - from Trinity, Cambridge and Oxford - emphatically support the basis of the non-celt, Atlantean perspective. Finally, in agreeing to support the new publication, the Irish Heritage Council has given its 'nihil obstat' imprimatur to the Atlantean thesis. The questioning nature of the Irish psyche has ensured a demand for the films and the book both at home and internationally. Available from Lilliput Press (also online), Eason and Dubay and other major bookshops.